I just love creating new designs. I wish I had more time to do this. I recently came up with a few new designs. 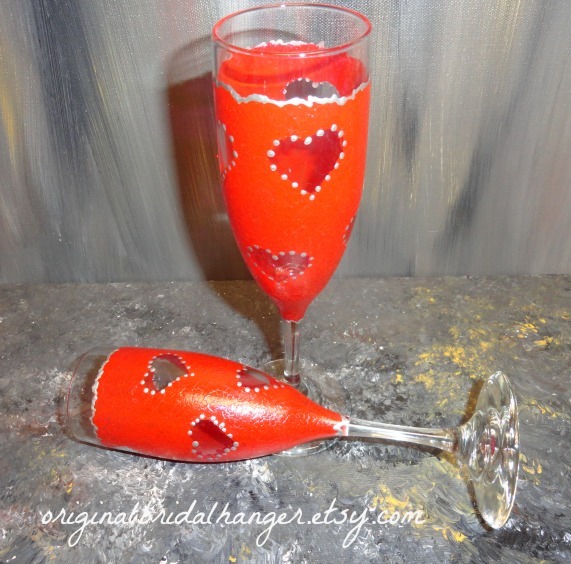 These glasses make awesome toasting glasses, or fun gifts to give for special occasions. 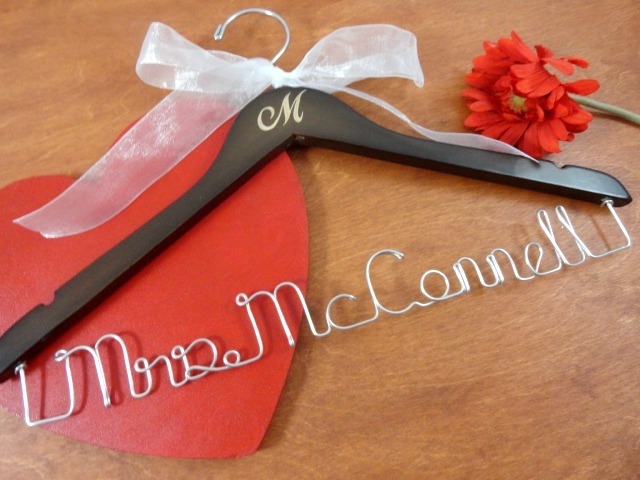 The first design is painted with silver metallic paint. I just star decals to leave part of the glass unpainted. After pulling off the decals, I painted small dots around each star with gold metallic paint. I added and ragged line of paint around the top and around the stem where the paint ends. This gives the glass a finished look. I think they turned out nicely. The next set I really like too. I used red paint. No metallic this time...I placed heart decals on the glass in order to have unpainted heart shapes. Once I pulled off the decals, I painted silver metallic dots around each heart. I used the silver metallic paint to paint a ragged line around the top of the glass, and where the paint ends on the stem. Again, this was done to provide a finished look. The final set, I think is really fun. Kind of whimsical. I placed circle decals on the glass to have unpainted circles. 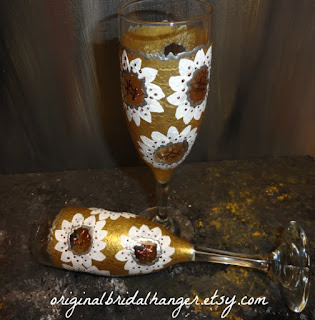 I painted gold metallic paint on the glass. Once I removed the decals, I painted white petals around each circle. I painted around each circle with silver metallic paint. I added hash type design in the center of each circle with metallic copper. I also added metallic copper dots on the petals of each flower. 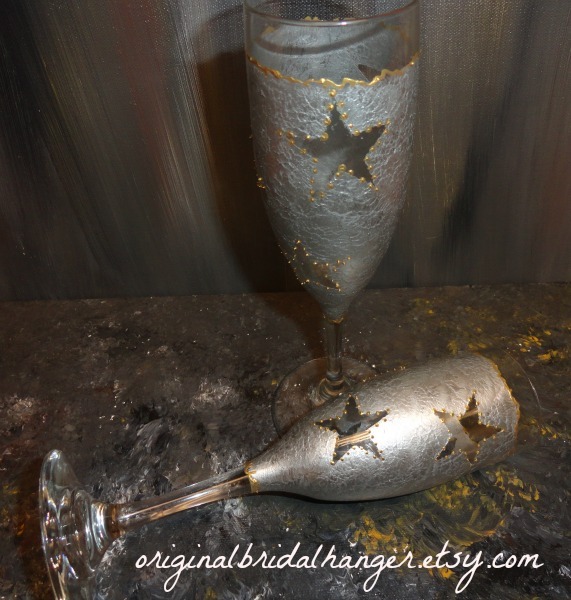 I have listed each of the champagne glass sets in my shop. They are available for sale now. 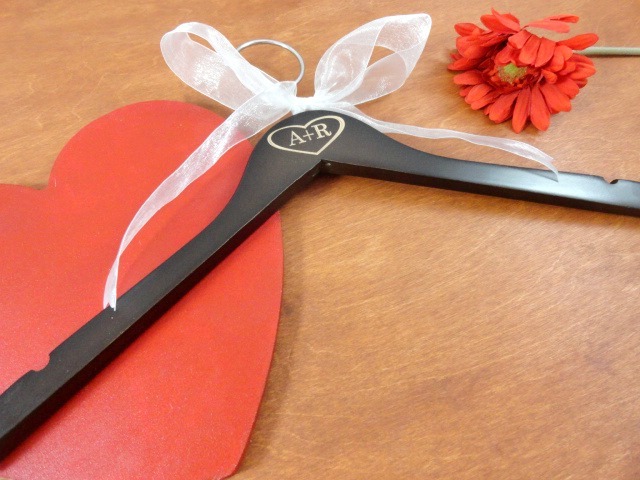 They are $25 + shipping. Great price for nice glasses! 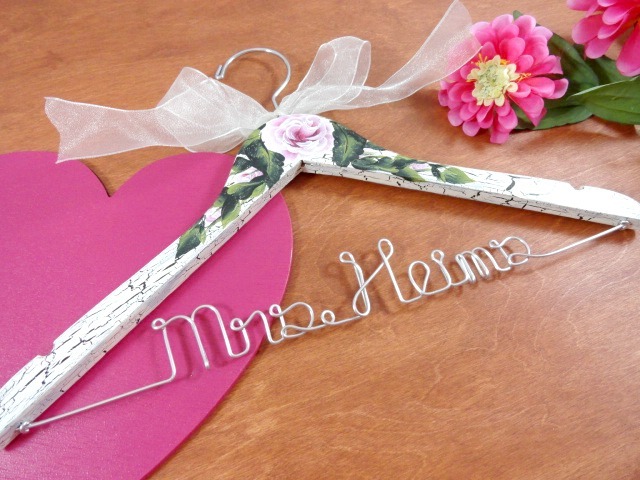 If you want to check out my shop, please stop here: Amy's Original Bridal Hangers .